Well, that's ducky. Baseball Prospectus sees the Cardinals as the clear favorite in the division (a 5-game lead is quite a bit in a team projection), with the Cubs playing second-fiddle, and the rest of the teams more or less equivalent to one another. The Reds are projected to have the worst offense in the division, by a significant margin, but a fine defense that leads to good run prevention. In this graph, the best teams are in the bottom-right. The top-left is a bad place to be, and it's inhabited by four teams that are widely expected to struggle. The only thing keeping the Reds out of the top-left, as it turns out, is their fielding: the Reds have the second-best fielding projection in the NL, and it pulls their overall defense (pitching + fielding) down into the better-than-average area. The Dodgers look really good, don't they? Washington Nationals check in as the best pitching-and-defense by a hair on the strength of their rotation, whereas the Cardinals should have the best offense of any team not called the Dodgers. I think the Pirates are interesting here: PECOTA likes their offense a lot, but has major concerns about their ability to hold their opponents in check. 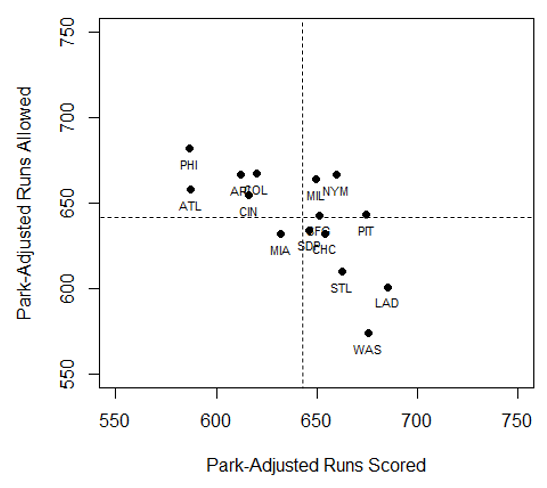 After park adjustments, they have the second-worst pitching-and-fielding combination in the league, behind only the Rockies. Things aren't a lot rosier when it comes to the FanGraphs projections. Actually, they're worse. FanGraphs sees the Central a lot closer to a three-team race, with the Pirates getting a five-game jump on this system to be right in the thick of it with the Cardinals and Cubs. The Brewers and Reds are ranked a distant 4th and 5th, respectively. Sigh. 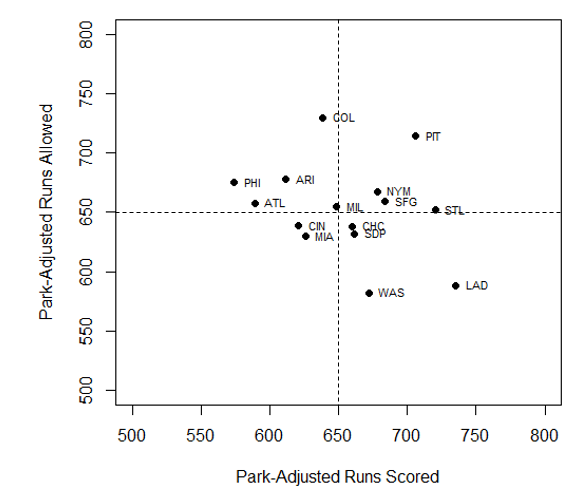 Minor note: the projected run environment is a tad lower with FanGraphs, averaging 640 runs per team instead of 653 runs per team. In any case, FanGraphs is not quite as bullish on the Reds' ability to prevent runs as BPro, while being just as pessimistic on their ability to generate runs. As with BPro, FanGraphs sees the Reds' fielding as superb, +22 runs above average. But their pitching isn't rated quite as highly, which means overall they are pegged as a slightly below-average defense coupled with a well below-average offense--and that's even WITH Joey Votto projected to get 550 PA's, which seems darn optimistic to me right now. Some other interesting things: FanGraphs likes the Cardinals' and Pirates run prevention a LOT more than BPro. Pittsburgh elevates all the way to average run prevention. Meanwhile, the Cardinals vault into the exhaulted well-above-average territory, inching toward the Dodgers and Nationals in the "Uber-team" category. Meanwhile, the Cubs stay right where they were, again looking like a legitimate threat in the Central. Team-level projections have huge error bars around them because you more or less compound all of the error on teach player projection to sum it up to the team level. But they are identifying some important problems for team, even if it's healthy. They're going to be playing 1-2 position players who are arguably not deserving of starting jobs in Byrd and Cozart. Their bench is basically a collection of replacement players, and provides little depth outside of Eugenio Suarez (if he even gets to play). The rotation isn't what it was when the 2012-2013 Mat Latos was here, and again offers little depth after the first few guys. And the bullpen could be Aroldis Chapman and a bunch of replacement guys. And these projections assume that everyone is more or less healthy, which is far from certain. There's a brighter, rosier side to each of those arguments. The fan in me wants to protest on most of those points. I want to believe that Jay Bruce is going to bounce back. I want to buy into a lot of our bullpen arms, and I certainly like Mike Leake a lot more than FanGraphs does. And I take some heart in that no position is projected to be replacement level, unlike last year's left field situation. Still, whereas last season I was still pretty optimistic about the Reds despite mediocre projections, this season I'm probably more pessimistic than optimistic. This feels more like the seasons when I broke in as a Reds blogger, extolling the offensive virtues of Rich Aurilia, than things did during the 2010-2013 seasons. In a way, it's sort of relaxing. I'm excited for baseball this season, and I don't feel like I'm setting myself up to have my heart broken by this team. I'll cheer them on, and watch their progress with interest. And who knows? Maybe they'll still surprise.